The Rixos Saadiyat Island welcomes you to the only Ultra All Inclusive Resort in Abu Dhabi, a unique destination with a touch of refined style and taste. The pristine beach of Saadiyat Island overlooking the Arabian Gulf is within close proximity to the popular Saadiyat Beach Golf Club, the iconic Louvre Abu Dhabi and other major attractions the capital has to offer. Enjoy additional services including jet skiing, tennis lessons and access to the fitness centre during your stay. Additionally, you can cool off after a round of golf in the private outdoor pool, or take advantage of the spa facilities to wind down. 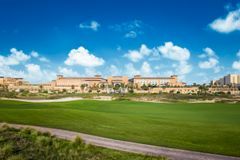 Inspired by arabesque architecture, Rixos Saadiyat Island offers refined luxury and comfort within its rooms and suites while you experience the Ultra-All-Inclusive concept which provides unlimited access to a variety of dining, leisure and entertainment activities including water park & wave pool to indulge in throughout your stay. The luxury villas, designed for travellers seeking the finer experience in life, deliver unparalleled levels of comfort, privacy and elegance. Enjoy ultimate serenity and well-being in the resort's 2,060 square metre Turkish-inspired spa featuring a traditional Turkish hammam and offering a variety of wellness treatments from the Far East. The resort is also equipped with a spacious 1,200 square metre ballroom to comfortably host events of up to 700 people. Its unique design also allows the ballroom to be divided into smaller conference rooms.